BEST-selling rock band Kasabian made up for missing out on a single nomination at the Brits by picking up three gongs at last night’s NME Awards. Singer-songwriter Jamie T also picked up a hat-trick of gongs, winning best track and best video for Zombie and music moment of the year for his comeback gigs which saw him return after almost four years of silence. Other winners included Royal Blood, who were named best new band and best live band and performed their track Figure It Out on the night. 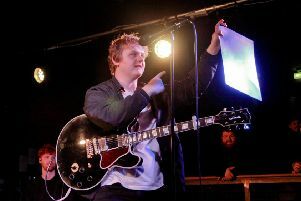 The event – formally known as the NME Awards 2015 with Austin, Texas – were hosted by Radio 1’s Huw Stephens. Charli XCX picked up the dancefloor filler award for her collaboration with Iggy Azalea on Fancy, before performing her current single Doing It, and Glastonbury was named best festival. Jake Bugg fought off competition from Jack White, Jamie T, La Roux, Lana Del Rey and St ­Vincent to be crowned best solo artist, and Foo Fighters were named best international band by Chrissie Hynde. The evening also saw a special award presented to guitarist Jimmy Page, who earned legendary status with Led Zeppelin. The 71-year-old was awarded the Rock’n’Roll Soul Award in recognition of his status as one of rock’s most celebrated guitar players. Page began his career as a session musician, playing on tracks by the likes of The Who, The Kinks and Them. He also had a stint with pioneering rockers The Yardbirds, playing alongside Jeff Beck and later replacing him in the group which eventually became Led Zeppelin. “This special one-off award has been created to reflect one of the most important and iconic figures to have ever picked up an instrument. There is nobody in popular culture quite like Jimmy Page,” he added. The seminal English guitar band Suede were recognised with the Godlike Genius award, and performed a short set at the ceremony. One of the most influential groups of the early 1990s, they won the 1993 ­Mercury Music Prize for their debut album. The award has previously gone to the likes of Johnny Marr, Paul Weller, Manic Street Preachers, The Clash, New Order and Massive Attack, as well as music industry figures such as Alan McGee, who helmed Creation Records, the late DJ John Peel and Michael Eavis, founder of the Glastonbury festival. Ukip leader Nigel Farage was named Villain Of The Year, beating Bono, David Cameron, Harry Styles, Russell Brand and Taylor Swift to the award and 5 Seconds Of Summer won worst band. Scottish nominees who missed out on prizes included Chvrches for best British band, Edwyn Collins for best music film and T in the Park for best festival. There were 22 categories in all at last night’s ceremony, with music fans casting hundreds of thousands of votes to decide the winners.